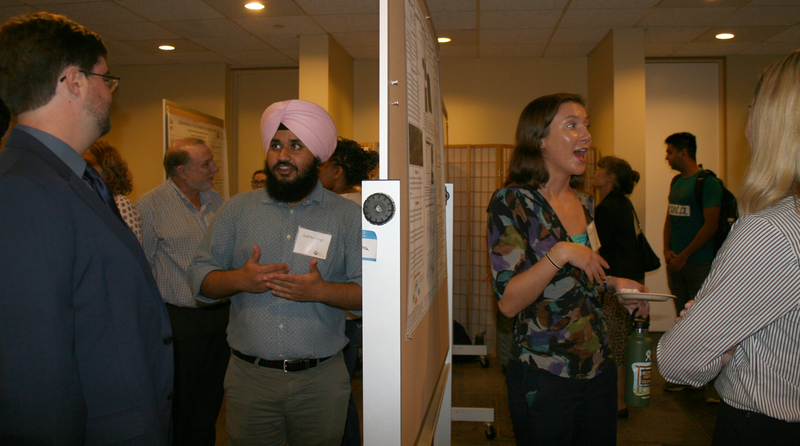 The students, working with mentors drawn from the faculty, worked in an astonishing array of areas this past summer. Conversations wafted throughout the room about fuel economy in rural Mass., drones that monitor salt marshes, wine grape cultivars, and more. 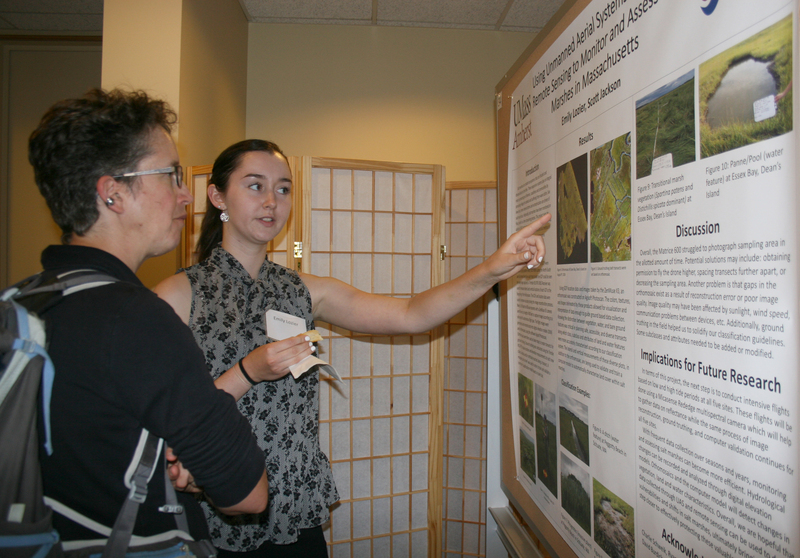 This summer of research and extension was funded and organized by the University’s Center for Agriculture, Food and the Environment (CAFE), with help from a generous donation from the Massachusetts State Grange. The program entered its third year in 2018. Judging by the talk swirling around at the top of the campus, it was a success. This opportunity allowed for deep educational experiences on specific topics of interest to the students. 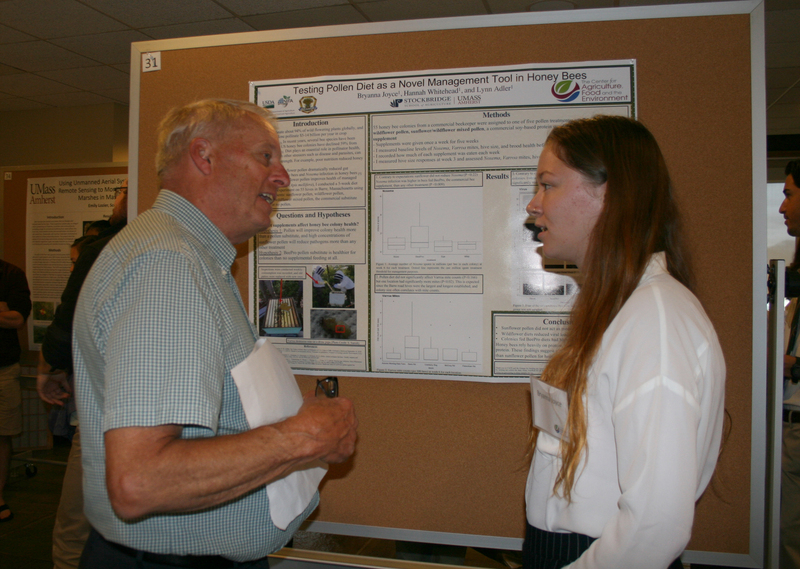 Sometimes the topic aligned perfectly with the individual student’s major; in other cases, the research or outreach was unrelated to the undergraduate’s primary interest and horizons were stretched! You would be hard-pressed to find two harder working Summer Scholars than Haley Goulet and Samantha Kelm. The two of them worked on the Extension side of the Summer Scholars Program, creating educational experiences for young participants in the UMass summer animal and science academies (short but intense learning experiences for young people held on or near the UMass Amherst campus). Oh, and they also each maintained two additional jobs that included serving up coffee at a local shop and milking cows at 5:00 a.m.
Goulet and Kelm made a great team since they share a passion for animals from dairy cows and goats to reptiles. This summer, they teamed up to share their love and knowledge of animals with young students. They bunked in stalls with cows and sheep at county fairs, taught at the UMass academies and taught young 4-H’ers what they had learned, aiming for the right developmental level. Kelm said a big challenge for her was her lack of classroom experience, she had to learn to narrow her choices of information to make her presentations appropriate for younger students. Goulet started the summer not knowing much about large animals, but says that over the summer she quickly got up to speed. 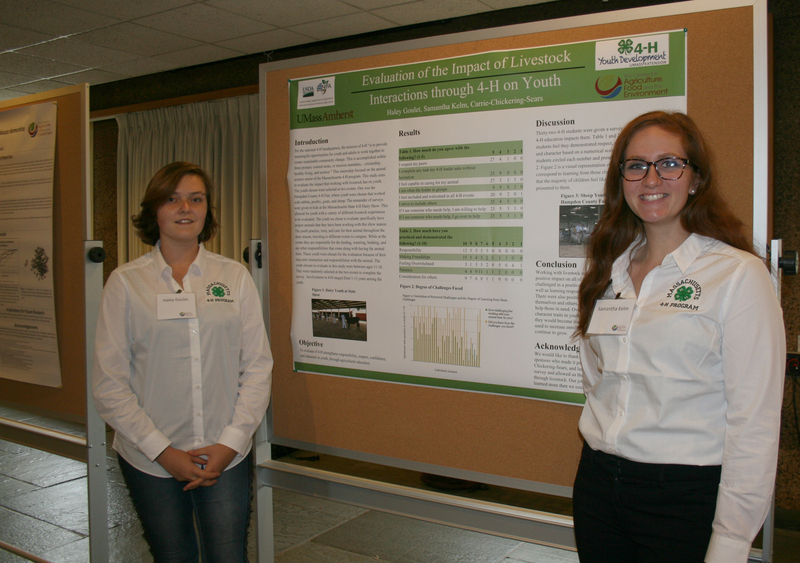 Together, Kelm and Goulet collaborated to evaluate the impact of working with livestock on the youthful participants. When Kelm graduates next spring, she hopes to attend a veterinary school and concentrate on food production animals, especially dairy cows. Goulet (’20) has a passion for zoo animals, especially reptiles, reinforced during a stint working at the Southwick Zoo in Mendon, Mass. Under the direction of UMass Extension animal science educator Carrie Chickering-Sears, these two made a real difference in the lives of many of their young students. This year, CAFE pioneered a new module for the Summer Scholars Program, the Public Policy Fellows. Five Fellows were selected for this pilot year, some undergraduates and some graduate students. 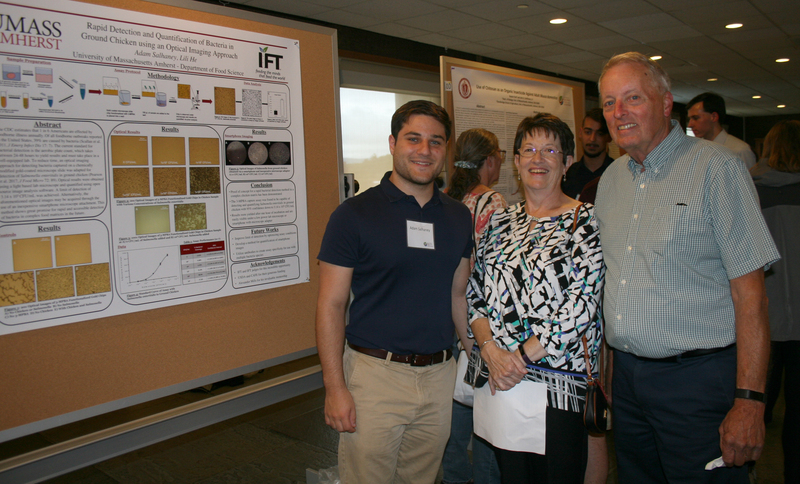 As in the undergraduate program, all worked with a mentor for the summer. They were placed in agencies and organizations around the state to get their hands dirty in the policy arena. Some of the groups where the Fellows were placed included the Franklin Regional Council of Governments, the Massachusetts Food Systems Collaborative, and Make-It Springfield makerspace. The five focused on topics including: economic development for small businesses; clean energy; climate change adaptations; stream crossing resiliency; and local food affordability. The Policy Fellows had the opportunity to become directly involved with those who are involved in making or implementing policy and regulation. Funding for the Summer Scholars Program came from the Massachusetts Grange, the National Institute of Food and Agriculture at U.S.D.A. and the UMass Center for Agriculture, Food and the Environment.